Good friends are hard to find and even harder to leave. 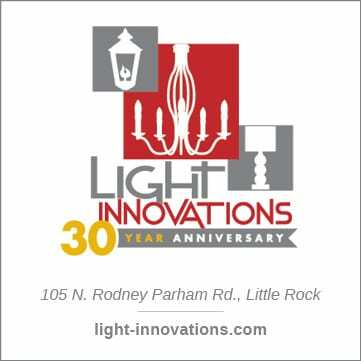 That’s one of the reasons the owners of this west Little Rock home have stayed in a community filled with dear friends for almost 25 years “We built in this neighborhood in the mid-1990s. We had a group of six friends, and, at the time, we were all looking for a place to land. We decided to develop a new area of this neighborhood along the ridge,” the homeowner says. 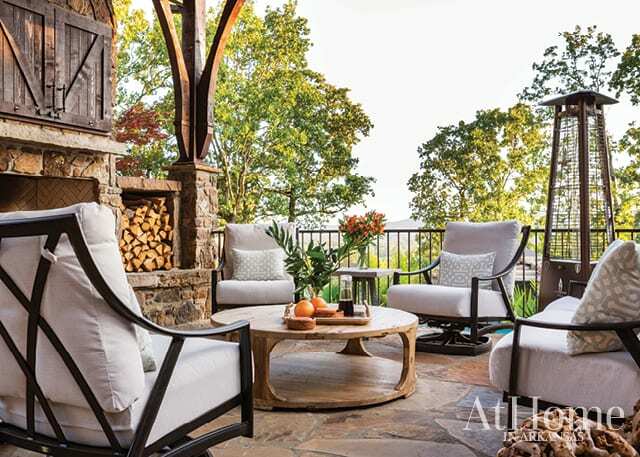 Inspired by the look of the Worman House, a former residence-turned-dining-and-event hall at Missouri’s Big Cedar Lodge, the homeowners called on landscape designer Chris H. Olsen of Botanica Gardens to update and upgrade the home’s backyard. “We first used Chris 20 years ago, and we really love his creativity and the way he sees things and listens to us,” the homeowner says. 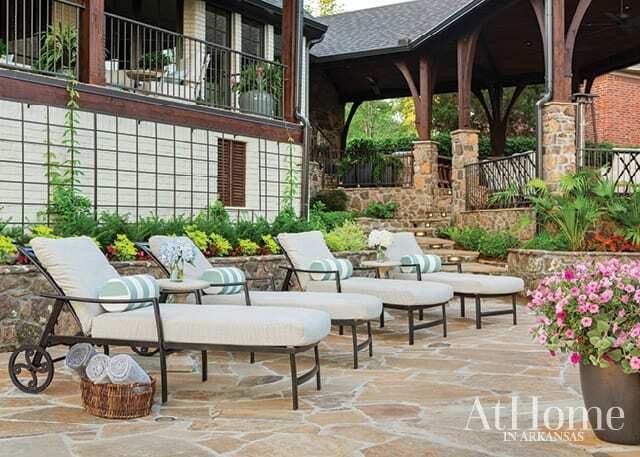 Chris, along with contractor Mary Jane Herr, Diamond Pools, and Providence Design, turned this backyard into an oasis the entire family can enjoy together for years to come. 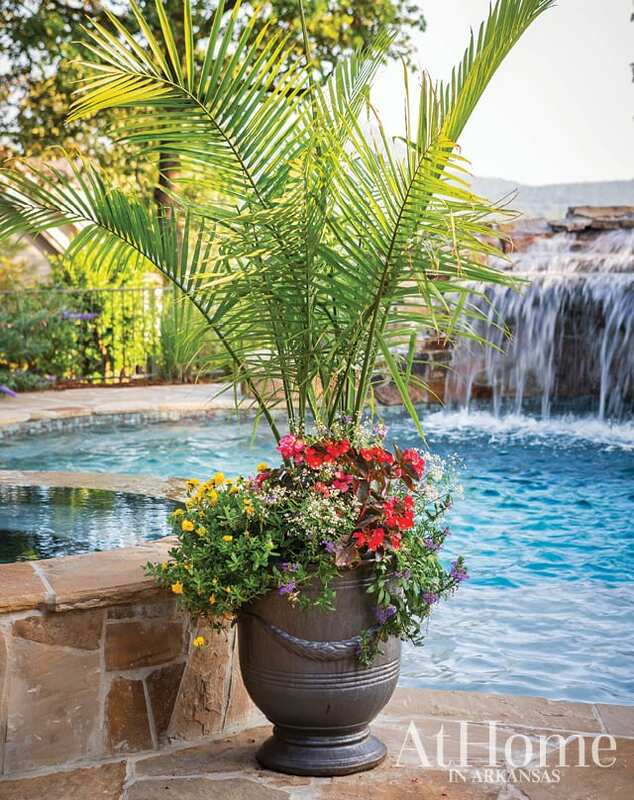 “We wanted the pool to be aesthetically pleasing but also a place everyone would really use,” the homeowner says. 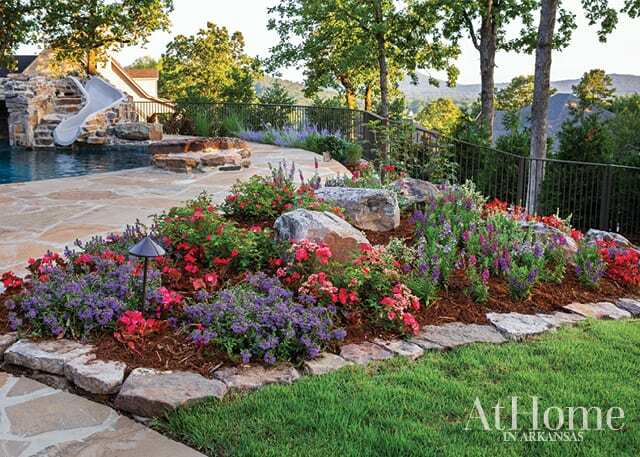 Diamond Pools built a fun-filled design featuring geysers, a built-in hot tub, a waterfall with a grotto (which is the perfect hiding cave for the homeowners’ grandsons), a wraparound slide, and even a pair of fire features that appear to frame a view of Pinnacle Mountain at dusk. 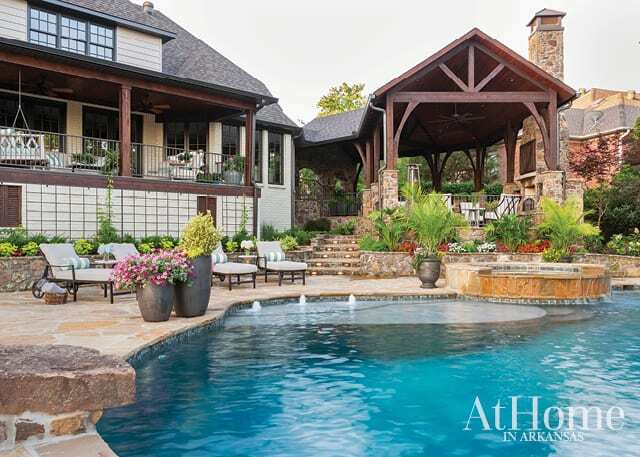 The pavilion features an outdoor fireplace and comfortable lounge area, where the homeowners take in Razorback games long after pool season has passed. “This area has one of the best views of Pinnacle Mountain in the backyard,” Chris notes. 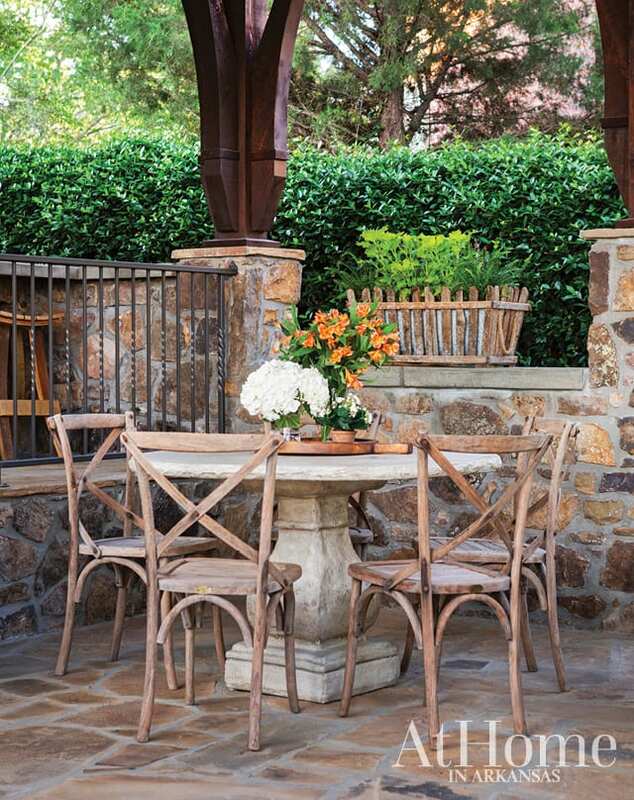 Thanks to a thoughtful design, the pavilion is connected to a door that leads to the home’s kitchen, making it easy to bring food and dishware indoors and out. A small dining table and coordinating chairs are a favorite perch for the grandchildren to have post-swim meals and play games. This is one of three zones within the pavilion, which also includes a seating area and outdoor kitchen/grill space. Variety is the name of the game on the beds that skirt the outer edge of the pool. Drift roses, rosemary, ‘Big Series’ begonias, and hardy hibiscus sing in shades of red and purple, while euonymus provides ground cover. “I also added some blue scaevola in this area; it’s a great planting around pools because its cool color plays well with the water,” Chris says.